order received.Once your order has been confirmed, we will not be able to make any changes. works that are licensed to Jollychic.com .Copyright 2013-2018, Jollychic.com ALL RIGHTS RESERVED. order and notify you of such cancellation. obligations (including without limitation, payment obligations) of the parties arising before the date of termination. criminal offense, violate the rights of any party or which may otherwise give rise to liability or violate any law. of any other commercial online service or other organization. In an attempt to provide increased value to our visitors, Jollychic.com may link to sites operated by third parties. any feedback on not only its own site, but for sites it links to as well (including if a specific link does not work). currency denomination, is the current price you are liable to pay to Jollychic.com, excluding shipping. holding shall not affect the validity of any other term, clause or provision herein contained. without written price verification does not constitute acceptance of the price contained in the order. or, if no request for quote was made, when placing an order with the Our Company . are lower than prices quoted are established by government regulations. Buyer will be paid for by Buyer. All cost of packing and shipment for Buyer's special equipment shall be paid for by Buyer. Our Company may, at its option (and in addition to other remedies), cancel any unshipped portion of this order. Buyer is to remain liable for all unpaid accounts. transportation bill signed by carrier noting that carrier received the goods from Our Company in the condition claimed. to perfect and maintain such right and title in Our Company . freight charges, and shall be assessed a restocking fee of $100 or 20% of the order, whichever is greater. Company , in addition to any damages proved by law, reasonable attorney's fees and costs of collection. the date the goods are received by Buyer. or statutory, including implied warranties of merchantability or fitness. of Buyer against Our Company for breach of any of Our Company's obligations, whether of warranty or otherwise. Rules in force when the Notice of Arbitration is submitted.The law of this arbitration clause shall be Hong Kong law. The arbitration proceedings shall be conducted in English. the English language version shall prevail. Welcome to JollyPay. The following terms and conditions regulate the relationship between you and JollyPay. Please read the terms and conditions carefully before browsing, downloading, registering on, accessing, or using the JollyPay relevant website, or associated sites linked to the website, or the JollyPay mobile application or any similar platform run by JollyPay Hong Kong Limited (hereinafter collectively, the JollyPay Platform, the JollyPay, We or Us) on any device and/or before availing any Services offered by JollyPay on the JollyPay Platform which may include Services such as online shopping payments, prepaid recharges, payment for cards or tickets, digital wallet services, refund, or any such other services which may be offered or added on the JollyPay Platform and which will henceforth be a JollyPay Services, from time to time (hereinafter individually, and collectively, the JollyPay Services). For the avoidance of doubt, it is clarified that these terms and conditions shall apply to all JollyPay Services, whether offered by JollyPay or its affiliates. The words You and the User refer to the person(s) or corporate(s), partnership firm(s) who open the account on JollyPay and shall include both singular and plural. Reference to masculine shall include the feminine and third gender. As used in this Terms and Conditions: (a) the singular includes the plural and vice versa, and words in one gender include all genders; (b) the meaning of "include” is to be interpreted as being nonrestrictive and without limitation; (c) a reference to a "person” includes any individual, firm, body corporate, partnership, association, organization, or government or inter-government body (whether or not having a separate legal personality); (d) a reference to a "party” means You, the User or JollyPay; (e) a reference to a "third party” means any person or entity other than a party; and (f) unless otherwise qualified, a reference to a clause, paragraph, section, or schedule is to a clause, paragraph, section, or schedule of this Terms and Conditions. “Agreement” shall mean this Terms and Conditions including any additional or modified terms and conditions in relation to any JollyPay Services or any future Services that may be offered by JollyPay, from time to time in relation to subject matter of this Terms and Conditions. “Entity” shall mean the entity which operates an active website/mobile application/billing system for the purposes of enabling the User to view Commodities and/or Services and to enter into transaction for purchase and/or subscription offered by the Entity. “User” means any person or company/ corporation holding a valid payment instrument and who enters into transaction with the entity and makes payment for the same, through JollyPay platform. “User Order” shall mean an order placed by the User for purchase of commodities or for availing of Services and shall be specifically designated by a unique Order Number which can be used by the User for obtaining details about the order including without limitation details of the status of such Order. “Commodities/Services” means a tangible merchandise, marketed, distributed or sold or service provided by the Entity, and/or it is authorised Vendors to Customer(s). “Bill” would means and include but not limited to any bill of online shopping, recharges, or airline tickets, travel tickets, hotel tickets as well as any other amount that may be collected by JollyPay or its affiliates or business partner (in accordance with the nature of its business). “Bill Payment” shall mean the amount of Bill to be paid by the User. “Billing Information” means the information provided by an entity either through API and/or in any other manner detailing the Bill, identification of the User/Bill, amount of the User Charge, etc. “Charge” means and includes (a) the sale price of the Commodities/ Services purchased or availed by the User plus the shipping charge (if any) and all other taxes including Commodities& Services tax, duties, costs, charges and expenses in respect of the Commodities / Services (hereinafter referred as "Tax”); and/or (b) amount of Bill Payment, that are to be charged to the User’s Valid Payment Instrument and processed and settled through the JollyPay Services. “Facility Provider(s)” shall means and connotes various Banks, Financial Institutions ("Participating Banks”) and various software providers who have signed with JollyPay from time to time and are in the business of allowing JollyPay to route credit card, debit card, internet banking, prepaid cash card or mobile wallet transactions (with respect to JollyPay Wallet, such Facility Providers shall include JollyPay). “Payment Instrument” means a Credit Card, Debit Card, Internet Banking Account, Prepaid Cash Card or other Payment Services or JollyPay Wallet used by the User for making a payment through JollyPay platform. “JollyPay wallet” shall means a payment instrument of digital wallet issued by JollyPay, which can be used by the User against the value stored on such instrument to purchase commodities and Services. “Credit Card/Debit Card” means Credit Card / Debit Card provided by Facility Providers to the User for the User’s Bank account held with Issuing Banks or any other card offered by the Facility Providers. “Business Day” shall mean any day for business in Hongkong other than non-working Saturday, Sunday and any days declared by JollyPay as a Holiday. All the JollyPay Services are rendered by JollyPay through the JollyPay Platform under the brand name "JollyPay” (or any derivatives or variations thereof). By browsing, downloading, registering on, accessing, or using the JollyPay Platform for any general purpose or for the specific purpose of availing any JollyPay Services, You agree to be bound by following terms and conditions and by the specific-services terms and conditions applicable to any each JollyPay Services (hereinafter collectively, the T&Cs). The T&Cs shall also include any additional or modified terms and conditions in relation to the JollyPay Services or any future services that may be offered by JollyPay on the JollyPay Platform. By browsing, downloading, registering on, accessing, or using the JollyPay Platform or availing any JollyPay Services, You automatically and immediately agree to all the T&Cs. If at any time you do not wish to be bound by the T&Cs or do not accept or agree with any of the T&Cs, You may not browse, register on, access, or use the JollyPay Platform and immediately terminate your availing the JollyPay Services. Accepting or agreeing to the T&Cs will constitute a legal contract between You, an individual or entity user of the JollyPay Platform or beneficiary of the JollyPay Services, and JollyPay. The JollyPay Services shall be used by You subject to your adherence with the T&Cs. By accepting the T&Cs or by otherwise using the JollyPay Services on the JollyPay Platform, You represent that You are an individual of at least legal age of majority or entities/non individuals such as corporates, partnership firms etc., and have not been previously suspended or removed by JollyPay, or disqualified for any other reason, from availing the JollyPay Services or using the JollyPay Platform. The JollyPay Services are not available to persons under the legal age of majority or to anyone previously suspended or removed by JollyPay from availing the JollyPay Services or accessing the JollyPay Platform. You represent and warrant that You have the right, authority and capacity to enter into this T&Cs and to abide by all the T&Cs as part of this Agreement. You shall not impersonate any person or entity, or falsely state or otherwise misrepresent your identity, age or affiliation with any person or entity. In the event of any violation of the T&Cs, JollyPay reserves the right to suspend or permanently prevent You from using the JollyPay Platform or availing JollyPay Services. JollyPay is an intermediary and a payment aggregator, facilitator which facilitates the User to pay Transaction Amount through internet payment gateway of JollyPay in respect of the amount of the Bill to be collected from the User through JollyPay Platform. Subject to and in accordance with the terms and conditions contained herein, JollyPay will provide to the User payment solutions including online shopping payments, prepaid recharges, payment for cards or tickets, digital wallet services, refund, or any such other services which may be offered or added on the JollyPay Platform so as to enable the User to make the payments of his online transaction. By JollyPay Services, JollyPay enables the User to make his online payments for a transaction at the Entity’s Website or Mobile Application/Billing System. While providing the said services, JollyPay acts as payment platform by connecting the Entity and its customer to enter into transaction and/or enable its customer to make online payment of Transaction Amount and integrating the Entity’s Website/Mobile Application/Billing System with the payment systems of various Facility Providers for enabling the customer of the Entity to make the payment of his Transaction Amount. The User, as the Customer of the Entity, shall strictly adhere to the provisions of the T&Cs and the payment procedural guidelines as issues by JollyPay, and any other relevant guidelines as maybe applicable to the User from time to time. For the use of the JollyPay Services, you should have a user account of JollyPay. By registering and creating an account on online shopping platform named Jollychic, which is the associated companies of JollyPay and cross-border e-commerce entity owning a global online shopping website and app application (hereinafter referred to as, the Jollychic), JollyPay will offer the User of Jollychic a JollyPay account with specific log-in access / data, after the User successfully registers on Jollychic, without going through a separate JollyPay registration process. There will be a link of the T&Cs which is not provided on Jollychic to the User, then the User are expected to accept the T&Cs for creating the JollyPay account. The information the User provides to JollyPay when the User applies and/or logs in his account is intended solely for personal use by the User and therefore always to be kept secret and safe. The User is not entitled to share his account details with third parties or to disclose them otherwise. The User is obliged to inform JollyPay immediately on becoming aware of and/or suspecting a case of any unauthorized use, disclosure and/or misuse of his access data or of the User account. Furthermore, the User is obliged not to use the user account of another person. Creating or registering account as a JollyPay user is only allowed if the User meets the eligibility criteria as set out by JollyPay. The User agrees to accept any responsibility for all activities that occur under his account or password. JollyPay reserve the right to refuse any account registration for any reason at its discretion and has right to disable any user account at any time if in reasonable opinion of JollyPay the User have failed to comply with any of the provisions of the T&Cs. JollyPay may send alerts to the mobile phone number provided by You while You register for the JollyPay Services, or via e-mail or push notifications. The alerts will be received in case of SMS if the mobile phone is in ‘On’ mode to receive the SMS. In case of e-mail, only if the e-mail servers and e-mail IDs are functional, and in case of push notifications, if the user has enabled the receipt of such notifications. If the mobile phone is in ‘Off’ mode or if the e-mail servers or IDs are not functional or if the push-notifications feature has been turned off, then You may not get the alert at all or get delayed messages. Providing SMS/e-mail/push notifications (hereinafter individually, and collectively, the Alerts) by JollyPay shall be deemed that You shall have received the information sent from JollyPay during the course of, or in relation to, using the JollyPay Platform or availing any JollyPay Services. The Alerts provided by JollyPay is an additional facility provided for your convenience and that it may be susceptible to error, omission and/or inaccuracy. JollyPay shall not be liable for non-availability of Alerts Services in any manner whatsoever and shall not be under any obligation to confirm the authenticity of the person(s) or entities receiving the alert. JollyPay shall not be responsible for any non-delivery, delayed delivery or distortion of the alert in any way whatsoever and not be liable for any loss, damages, claim, expense that may be incurred/suffered by You on account of the Alerts facility. The User shall disclose the information or data for which the User will be using JollyPay Services and shall only avail the said services for the designated/specified payment category. The User may disclose the sensitive information, if it needs to be disclosed pursuant to any requirement of JollyPay, any order/direction of a court and/or regulatory authority of competent jurisdiction. The User agrees and acknowledges that JollyPay will be acting as data controllers in respect of personal data pursuant to the T&Cs. 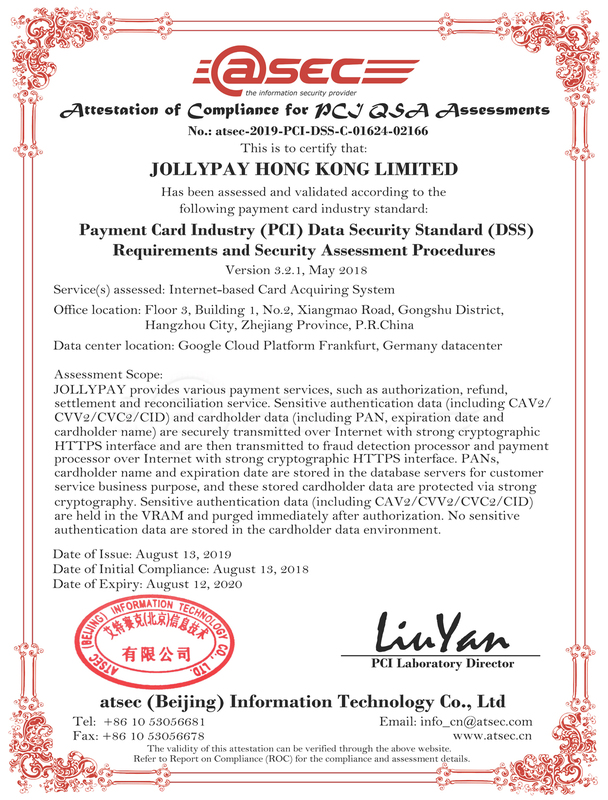 JollyPay, at all times, agrees to comply with applicable privacy laws in respect of personal data, and shall protect and keep confidential all information related to Credit Card/Debit Card, Banking facilities or any other information the User disclosed to JollyPay. JollyPay agrees to comply with the all applicable laws and rules in connection with its collection of any personal, financial, card or transaction information on the JollyPay Platform. As a user on JollyPay, You hereby authorize JollyPay to process the payment of your transaction amount or Bill Payment through JollyPay Platform in respect of the transactions upon fulfillment of valid criteria as set forth by the Facility Provider(s) from time to time and accordingly transfer such approved transaction amount from the User Valid Payment Instrument to the designated bank account of an entity. JollyPay may reject authorization, instructions of payment placed by the User for any reason including but not limited to risk management, suspicion of fraudulent, illegal or doubtful payment, purchasing of prohibited items, use of blacklisted/banned cards etc., in accordance with the JollyPay rules, guidelines, regulations, etc., and any other applicable laws, rules, regulations, guidelines. The User shall be solely responsible for the accuracy and validity of Information and Data, including account creating or registering information, Bill information, User Charge (if any) and any other charges and/or other information provided to JollyPay relating to JollyPay Services availed by User. The User shall give necessary instructions to JollyPay so as to send technically valid transaction payment requests to the JollyPay. The User shall provide JollyPay access to the User Information through an payment gateway developed by JollyPay and implemented by JollyPay with the User’s assistance, or any other secure mode of transmitting the data contained in the User Information. The User shall provide a support to JollyPay and co-operate with and assist JollyPay in connection with any inquiries for any payment request that are received regarding the validity or correctness of the data included in the payment information in respect of such users. Notwithstanding anything provided herein or elsewhere in the T&Cs, the User shall be responsible for any disputes relating to the amounts payment requested to them relating to execution of standing instructions to the JollyPay. JollyPay cannot and will not be liable for any loss, damage or other liability arising from the User’s failure to comply with the T&Cs or from any unauthorized access to or use of the User Information. The User agrees to immediately notify JollyPay of any unauthorized use or incorrect information on the User Information or any other breach of security. The User hereby confirms that JollyPay shall not be responsible for any User complaints regarding inaccuracy or deficiency in Services or incorrect/expired/disputed and the User shall be responsible and shall take reasonable measures as may be required to resolve the same. The User understands and acknowledges that the date on which the User makes a payment of the User Transaction Amount through JollyPay/JollyPay Platform shall be considered as the date of payment by the User, and the User shall not penalize JollyPay for delay in payment. In the event that the payment due date for the User is Non-business days and the User makes a successful Transaction for payment of Transaction Amount through the JollyPay platform on Non-business days, JollyPay shall not be liable for any delay in payment (if any). As the vendor of JollyPay Services, the JollyPay Services was created and developed by JollyPay. JollyPay is the owner and the holder of all the intellectual property rights over each and all its elements, including any literature, manuals, reports, research papers, data, flow charts, drawings, designs, diagrams, tables, software, source code or object code or other information or materials in whatever form and on whatever media stored or held, acquired, created, developed, designed or otherwise prepared by the JollyPay and any related patents, trademarks, logos and Services marks, registered designs, utility models or applications for any of the foregoing. Design rights, copyrights and all or any similar or equivalent rights arising or subsisting in any country in the world shall be owned by JollyPay and all or any part thereof shall belong to JollyPay absolutely. JollyPay reserves the right to change or amend the JollyPay Services software of system at any time, to provide the User with a new version thereof, and to change the functionalities and characteristics of JollyPay Services. Except as expressly set out in this T&Cs, no assignment of or license under any Intellectual Property Right or Trade Mark or Services Mark, whether registered or not, owned or controlled by JollyPay is granted to the User by this T&Cs. The User shall not, under any circumstances, seek to register any trademark, business name, business processes, inventions, company name, domain name using or incorporating the Intellectual Property of JollyPay. JollyPay reserve the exclusive right of the sole conduct of the defense to any claim or action in respect of an intellectual property infringement and does not at any time admit liability or otherwise settle or compromise or attempt to settle or compromise the said claim or action except upon the express instructions of JollyPay. The User acknowledges that the entire documentation of JollyPay, available by using the JollyPay Services is and shall remain at all times the exclusive property of JollyPay. The documentation is protected by the copyright of JollyPay. It can only be used in the strict framework of the User T&Cs. The transmission, disclosure or copying of this documentation, in whole or in part, as well as the use or disclosure of its content, in whole or in part, or its misuse without the explicit written consent of JollyPay is strictly prohibited. JollyPay grants the User, who accepts the T&Cs, a non-exclusive license to use JollyPay Services, to the extent strictly necessary for enabling the User to create and manage his JollyPay Account according to the selected formula and within the limits and conditions of JollyPay. The license set out in article is personal to the User and cannot be assigned or sub-licensed without the prior written consent of JollyPay. The license does not transfer any property whatsoever, which rights shall remain owned entirely by JollyPay. The license provides no right to the source code or decompiled software. The JollyPay Services shall be used by the User only, to the exclusion of any other person and excluding the sale, rental, sub-contracting, leasing, etc. of said JollyPay Services. Confidential Information means any information, regardless of form, that: (a) is proprietary to or maintained in confidence by a party, (b) is not generally known to the public and either derives economic value, actual or potential, from not being generally known or has character such that such party has a legitimate interest in maintaining its secrecy, and (c) is disclosed by such party (the "Discloser”), or by a third party on the Discloser’s behalf, to the other party (the "Recipient”) or obtained by the Recipient (whether before, on, or after the Effective Date of this Agreement), directly or indirectly, through any means of communication (whether electronic, written, oral, aural or visual) or by observation. Each party remains the owner of all information or data made available to the other party. Each party undertakes to take all necessary steps to protect the confidential nature of all confidential data under the T&Cs, agreeing, in particular, to only use the confidential information of the other for the purpose of fulfilling its obligations set out in the T&Cs and not for any other purpose whatsoever. Each party undertakes to refrain from making any such confidential information available to any third party without the prior written consent of the other party. The obligation of confidentiality as described in article shall remain in effect throughout the entire lifetime of the T&Cs. • was known to JollyPay before the User and JollyPay entered into the T&Cs and JollyPay was not under any obligation of confidence in respect of the Confidential Information at that time. Either Party hereby undertakes and agrees to indemnify and hold harmless the other Party, from and against all actions, proceedings, claims, liabilities (including statutory liability), penalties, demands and costs, awards, damages, losses and/or expenses however arising as a result of: (i)Any breach of any applicable laws, and, rules and regulations (ii) misuse of the JollyPay Platform or JollyPay Services, (iii) any breach or non-performance by the Party of any of the provisions of theT&Cs and/or any representation and warranties, breach of confidentiality, Intellectual property rights, inaccuracy of information, charge back and refunds, any fines, penalties or interest imposed directly or indirectly on the other Party on account of the Party under the T&Cs; any act, neglect or default of either Party’s agents, employees; (iii)any claim by any other party against either Party, arising from sub-clauses above. The User shall also fully indemnify and hold harmless JollyPay, the Facility Providers and/ or the Participating Banks against any loss, cost, expense, demand or liability direct arising out of a claim by a third party that the User infringes any right or interest, any intellectual or industrial property rights of that third party. IN NO EVENT WILL THE TOTAL LIABILITY OF JOLLYPAY OR ITS AFFILIATES, CONTRACTORS, EMPLOYEES, AGENTS, OR THIRD-PARTY PARTNERS, LICENSORS, OR SUPPLIERS TO THE USER FOR ALL DAMAGES, LOSSES, AND CAUSES OF ACTION ARISING OUT OF OR RELATING TO THESE TERMS AND CONDITIONS, THE USER’S USE OF THE JOLLYPAY PLATFORM OR THE USER’S INTERACTION WITH OTHER JOLLYPAY PLATFORM USERS (WHETHER IN CONTRACT, TORT INCLUDING NEGLIGENCE, WARRANTY, OR OTHERWISE), EXCEED THE AMOUNT PAID BY YOU TO JOLLYPAY, IF ANY, FOR ACCESSING, USING THE JOLLYPAY PLATFORM DURING THE THREE (3) MONTHS IMMEDIATELY PRECEDING THE DATE OF THE CLAIM OR ONE HUNDRED DOLLARS, WHICHEVER IS GREATER. UNDER NO CIRCUMSTANCES, INCLUDING, BUT NOT LIMITED TO, NEGLIGENCE, WILL JOLLYPAY OR ITS AFFILIATES, CONTRACTORS, EMPLOYEES, AGENTS, OR THIRD-PARTY PARTNERS, LICENSORS, OR SUPPLIERS BE LIABLE FOR ANY SPECIAL, INDIRECT, INCIDENTAL, CONSEQUENTIAL, PUNITIVE, RELIANCE, OR EXEMPLARY DAMAGES (INCLUDING WITHOUT LIMITATION DAMAGES ARISING FROM ANY UNSUCCESSFUL COURT ACTION OR LEGAL DISPUTE, LOST BUSINESS, LOST REVENUES OR LOSS OF ANTICIPATED PROFITS OR ANY OTHER PECUNIARY OR NON-PECUNIARY LOSS OR DAMAGE OF ANY NATURE WHATSOEVER) ARISING OUT OF OR RELATING TO THESE TERMS AND CONDITIONS OR THAT RESULT FROM YOUR USE OR YOUR INABILITY TO USE THE MATERIALS AND CONTENT ON THE JOLLYPAY PLATFORM OR ANY REFERENCE SITES, OR ANY OTHER INTERACTIONS WITH JOLLYPAY, EVEN IF JOLLYPAY OR A JOLLYPAY AUTHORIZED REPRESENTATIVE HAS BEEN ADVISED OF THE POSSIBILITY OF SUCH DAMAGES. TO THE FULLEST EXTENT PERMISSIBLE PURSUANT TO APPLICABLE LAW, JOLLYPAY AND ITS THIRD-PARTY PARTNERS DISCLAIM ALL WARRANTIES OR GUARANTEES – WHETHER STATUTORY, EXPRESS OR IMPLIED – INCLUDING, BUT NOT LIMITED TO, IMPLIED WARRANTIES OF MERCHANTABILITY, FITNESS FOR A PARTICULAR PURPOSE, AND NON-INFRINGEMENT OF PROPRIETARY RIGHTS. NO ADVICE OR INFORMATION, WHETHER ORAL OR WRITTEN, OBTAINED BY YOU FROM JOLLYPAY OR THROUGH THE JOLLYPAY SERVICES OR THE JOLLYPAY PLATFORM WILL CREATE ANY WARRANTY OR GUARANTEE OTHER THAN THOSE EXPRESSLY STATED HEREIN. FOR THE PURPOSES OF THIS DISCLAIMER, YOU EXPRESSLY ACKNOWLEDGE THAT AS USED IN THIS SECTION, THE TERM "JOLLYPAY” INCLUDES AFFILIATES OF JOLLYPAY, ITS OFFICERS, DIRECTORS, EMPLOYEES. YOU ACKNOWLEDGE THAT JOLLYPAY IS AN INTERMEDIARY AND A PAYMENT AGGREGATOR AND IS NOT LIABLE FOR ANY THIRD PARTY OBLIGATIONS. YOU EXPRESSLY AGREE THAT USE OF THE JOLLYPAY SERVICES ON THE JOLLYPAY PLATFORM IS AT YOUR SOLE RISK. IT IS YOUR RESPONSIBILITY TO EVALUATE THE ACCURACY, COMPLETENESS AND USEFULNESS OF ALL OPINIONS, ADVICE, SERVICES, MERCHANDISE AND OTHER INFORMATION PROVIDED THROUGH JOLLYPAY GENERALLY. JOLLYPAY DOES NOT WARRANT THAT THE JOLLYPAY SERVICES WILL BE UNINTERRUPTED OR CORRECTNESS, ACCURACY, RELIABILITY OR THAT DEFECTS IN THE SITE WILL BE CORRECTED. THE JOLLYPAY SERVICES AND THE JOLLYPAY PLATFORM AND ANY DATA, INFORMATION, THIRD PARTY SOFTWARE, REFERENCE SITES, SERVICES, OR SOFTWARE MADE AVAILABLE IN CONJUNCTION WITH OR THROUGH JOLLYPAY ARE PROVIDED ON AN "AS IS” AND "AS AVAILABLE,” "WITH ALL FAULTS” BASIS AND WITHOUT WARRANTIES OR REPRESENTATIONS OF ANY KIND EITHER EXPRESS OR IMPLIED. JOLLYPAY, ITS LICENSORS, AND ITS PARTNERS DO NOT WARRANT THAT THE DATA, JOLLYPAY SOFTWARE, FUNCTIONS, OR ANY OTHER INFORMATION OFFERED ON OR THROUGH THE JOLLYPAY SERVICES/JOLLYPAY PLATFORM OR ANY REFERENCE WEBSITES/PLATFORMS/APPS/SERVICES WILL BE UNINTERRUPTED, OR FREE OF ERRORS, VIRUSES OR OTHER HARMFUL COMPONENTS AND DO NOT WARRANT THAT ANY OF THE FOREGOING WILL BE CORRECTED. JOLLYPAY, ITS LICENSORS, AND PARTNERS DO NOT WARRANT OR MAKE ANY REPRESENTATIONS REGARDING THE USE OR THE RESULTS OF THE USE OF THE JOLLYPAY SERVICES/JOLLYPAY PLATFORM OR ANY REFERENCE WEBSITES/PLATFORMS/APPS/SERVICES IN TERMS OF CORRECTNESS, ACCURACY, RELIABILITY, OR OTHERWISE. YOU UNDERSTAND AND AGREE THAT YOU USE, ACCESS, DOWNLOAD, OR OTHERWISE OBTAIN INFORMATION, MATERIALS, OR DATA THROUGH THE JOLLYPAY SERVICES/JOLLYPAY PLATFORM AT YOUR OWN DISCRETION AND RISK AND THAT YOU WILL BE SOLELY RESPONSIBLE FOR ANY DAMAGE TO YOUR PROPERTY OR INTEREST (INCLUDING BUT NOT LIMITED TO YOUR BILL PAYMENT AMOUNT, COMPUTER SYSTEM AND MOBILE DEVICE OR ANY OTHER EQUIPMENT OR LOSS OF INFORMATION OR DATA THAT RESULTS FROM THE DOWNLOAD OR USE OF JOLLYPAY SERVICES /JOLLYPAY PLATFORM.) JOLLYPAY DO NOT AUTHORIZE ANYONE TO MAKE ANY WARRANTY ON JOLLYPAY’S BEHALF AND YOU SHOULD NOT RELY ON ANY SUCH STATEMENT. THIS ARTICLE SHALL SURVIVE TERMINATION OF THIS T&CS. The Terms will continue to apply until terminated by either You or JollyPay as follows. You may end your legal T&Cs with JollyPay at any time for any reason by deactivating your accounts and discontinuing your use of the JollyPay Services. We may suspend or terminate your user account or cease providing You with all or part of the JollyPay Services at any time for any reason, including, but not limited to, if we reasonably believe: (i) you have violated the T&Cs, (ii) you create risk or possible legal exposure for us; or (iii) our provision of the JollyPay Services to you is no longer commercially viable. We may make reasonable efforts to notify you by the email address associated with your account or through the JollyPay Services the next time you attempt to access your account. JollyPay shall not be held responsible for delays or failings in the fulfillment of the T&Cs if such delays or failings arise from facts or circumstances reasonably perceived to be beyond the control of JollyPay, being unpredictable and inevitable, e.g. lightning, strike, fire, changed legal provisions or regulations provided by authorities, intervention by authorities, communication or transport disruptions, changes in exchange rates or natural disasters. The User agree that the viruses or other defects resulting from unauthorized access to software or non-authorized access to JollyPay Platform or any type of hacking, including in particular DOS attacks, shall be considered a case of force majeure. JollyPay shall be released from its liabilities until the circumstance given rise to its inability to fulfill its obligations no longer exists. If JollyPay is prevented to fulfill its obligation for a longer period than 30 days due to any such circumstance mentioned above, the Parties shall have the right, without being liable to pay compensation, to terminate the T&Cs with immediate effect. JollyPay reserves the right to change, modify, add, or remove portions of the T&Cs (each, a change and collectively, changes) at any time by posting notification on the JollyPay Platform or otherwise communicating the notification to You. The changes will become effective, and shall be deemed accepted by You, 24 hours after the initial posting and shall apply immediately on a going-forward basis with respect to your use of the JollyPay Platform, availing the JollyPay Services or for payment transactions initiated after the posting date. Your continued use of the JollyPay Platform following the posting of changes will mean that You accept and agree to the changes. If You do not agree with any such change, Your sole and exclusive remedy is to terminate your use of the JollyPay Services /JollyPay Platform. For certain changes, JollyPay may be required under applicable law to give You advance notice, and JollyPay will comply with such requirements. JollyPay may provide You with notices and communications by e-mail, SMS, push notifications, regular mail or postings on the JollyPay Platform or by any other reasonable means. Except as otherwise set forth herein, your notice to JollyPay must be sent by courier or registered mail to JollyPay. The validity, construction and performance of the T&Cs shall be governed and construed by the laws of Hongkong without regard to or application of its conflict of laws, provisions or your state or country of residence. If any dispute, controversy or claim arises under this T&Cs or in relation to any JollyPay Services or the JollyPay Platform, including any question regarding the existence, validity or termination of these T&Cs (hereinafter Dispute), the parties shall use all reasonable endeavours to resolve such Dispute amicably. If the parties are unable to resolve the Dispute amicably within 30 days of the notice of such Dispute, JollyPay may elect to resolve any Dispute by a binding arbitration in accordance with the provisions of the Hongkong arbitration ordinance. Such Dispute shall be arbitrated on an individual basis and shall not be consolidated in any arbitration with any claim or controversy of any other party. The seat of the arbitration shall be Hongkong and the language of this arbitration shall be English. Either You or JollyPay may seek any interim or preliminary relief from a court of competent jurisdiction in Hongkong necessary to protect the rights or the property belonging to You or JollyPay (or any of our agents, suppliers, and subcontractors), pending the completion of arbitration. Any arbitration shall be confidential, and neither You nor JollyPay may disclose the existence, content or results of any arbitration, except as may be required by law or for purposes of enforcing the arbitration award. All administrative fees and expenses of arbitration will be undertaken by the losing party. This paragraph shall survive termination of the T&Cs. Headings used in the T&Cs are provided for convenience only and shall not be used to define, limit or describe the scope of the T&Cs. If any provision contained in this T&Cs is determined to be invalid, illegal or unenforceable in any respect under any applicable law, then such provision will be severed and replaced with a new provision that most closely reflects the original intention of JollyPay, and the remaining provisions of this T&Cs will remain in full force and effect. The T&Cs shall not operate so as to create a partnership or joint venture of any kind between the JollyPay and the User. Nothing contained in the T&Cs shall be so construed as to constitute either party to be the agent of the other. Neither party shall have any authority to make any commitments on the other party’s behalf. The waiver of any breach or default of this T&Cs will not constitute a waiver of any subsequent breach or default, and will not act to amend or negate the rights of the waiving party. The T&Cs granted herein, may not be transferred or assigned by the User without JollyPay' s prior written consent which may be withheld in JollyPay' s sole discretion., but these T&Cs and any rights granted hereunder, may be assigned by JollyPay without any restriction. The Agreement is made in Arabic language and English language or other language on JollyPay platform. In the event of any different interpretation or inconsistency between these language versions, English language version shall prevail, and other language versions are deemed to be automatically amended to make the relevant part of these language versions consistent with the relevant part of the English language version. JollyPay facilitates the payment of online transaction for the User with respect to the commodities or Services offered by the Entity or JollyPay business partner. The Payment may be in the reference Bill of online shopping, prepaid recharges, as well as Bill of card, ticket and any other amount, etc. The stipulations set out in the Special Terms and Conditions are in relation to such Bill Payments and applicable to and binding on the User in conjunction with the General Terms and Conditions already accepted by the User. The term ‘T&Cs’ mentioned in the Agreement includes the General Terms and Conditions as well as the Special Terms and Conditions in relation to JollyPay Services or JollyPay Platform. JollyPay offers a convenient and secure way for the User to make payments towards identified biller(s) through whom the User may purchase certain commodities or Services. Unless otherwise stipulated, the User will not need to pay any JollyPay any Services Charge associated with accessing and using the JollyPay Services. Specific details related to the amount of Bill Payment would be available with the Entity or JollyPay business partner on their channel/portal/website. However, there may be certain fees which JollyPay may charge and the User may pay for JollyPay special services for availing the services as JollyPay may provide, e.g. JollyPay Wallet. The charge for JollyPay specific services shall be effective from the time when they are posted on the JollyPay Platform through which the User are availing the specific services. The User are bound by any addition or revision of the JollyPay specific services and should therefore visit the JollyPay in order to review the applicable fee (if any) which may vary from time to time. JollyPay will convert Bill Payment in a different currency to the applicable currency using the exchange rate which is the selling rate of the settlement date established by Facility Provider or participating bank or determined by JollyPay to the extent permitted by law. If the User is legally obligated to pay fees for availing any JollyPay special services under any applicable tax laws, and regulations and/or circulars issued by the relevant tax authorities, JollyPay should not be liable to deduct any withholding of payment received in accordance with the T&Cs and applicable laws, regulations and/or circulars of any tax authorities. In the event JollyPay receives notification from tax authorities, or in accordance with revisions to the applicable tax laws, or regulations and/or circulars issued by the Tax Authority, requiring deduction of tax, the User agrees that upon JollyPay receiving notification of requirement to withhold tax, JollyPay shall deduct such withholding tax amount. JollyPay may provide a withholding tax statement to the User indicating the amount of withholding tax paid on behalf of the User to the Tax Authority. JollyPay facilitates the payment of online shopping for the User with respect to certain commodities or services offered by the Entity or JollyPay business partner to enable their transaction Bills to be paid through the JollyPay Platform. The User can see the relevant web pages on the JollyPay Platform for more information on the Bill Payment Services. From time to time, JollyPay, at its sole discretion, can decide to accept or refuse the payment instructions in respect of the online transaction between the User and an Entity. The requirement upon which a payment can be made from the User to a biller can differ depending on what the Payment Instrument is used by the User when issuing the payment instruction. Further, depending on the specific Facilities Provider allowed by JollyPay, the payment may be made either by issuing a payment instruction for an online debit/charge to a payment account or by scheduling an automated debit to a payment account. The terms and conditions set out in this Article are applicable to prepaid recharge products available on the JollyPay Platform or JollyPay business partner including but not limited to recharges in relation to mobiles, game cards as well as to other prepaid recharge products that may be offered on the JollyPay Platform or its business partner. JollyPay may be a reseller of digital products, however JollyPay does not provide card operator services and is only a reseller of prepaid recharge services which are ultimately provided by a third party service provider or other distributors or aggregators. JollyPay shall not warrant, insure, or guarantee that card services to be provided by the other third party. Any dispute regarding the quality, quantities, cost, expiration, or other terms of the prepaid recharge purchased must be handled directly between You (or the recipient of the recharge) and the other services provider. JollyPay shall not be responsible for any failure, breach on the part of any of its recharge partners in effecting a recharge. JollyPay is an intermediary and provides the User the facility of card or ticket payment between the User and a vendor /merchant like the card or tickets services provider. For the purposes of this Article a vendor / merchant shall mean a card owner or the person or entity owning inventory of tickets or cards that are being sold on its Platform. JollyPay is not, at any point of time, during any transaction between the User and the merchant, owner of any of the card or ticket products/services provided by merchant and/or a ticket booking agent or provider. You agree and acknowledge that the actual contract for sale is directly between You and the merchant/vendor. If a link to the merchant/vendor specific terms and conditions is not provided here then you are expected to find them on their websites or procure them from the vendors/merchants directly through any other means. JollyPay is not responsible for your failure to access such terms and conditions of merchant/vendor or for any loss resulting from such terms and conditions or lack thereof. JollyPay shall not be liable for any fault in the content/booking/listing services provided by the merchant/vendor. JollyPay is also not responsible for setting or controlling the prices applicable to such card, ticket through the JollyPay Platform. JollyPay has no control over the existence, quality, accuracy, safety or legality of items, content or listings of the merchant/vendor. JollyPay offers a digital wallet service which is a software-based system for making payment of e-commerce transactions. By using the digital wallet, the payment of online purchase, authentication of the User can be done through the User’s computers or smartphones. By linking bank accounts of the Users or adding a bank card with JollyPay digital wallet, the User can use the wallet to make contactless payments through computer or smartphone instead of needing to carry a physical wallet with the User. Further, the User can use the digital wallet to make online shopping checkout a quicker and easier experience. A digital wallet is usually accessed by way of a username and a password, saving the User the effort of filling in a payment form with its personal and card details every time the User want to make a payment. The User may recharge its JollyPay Wallet through any of the permitted methods. The list of recharge outlets and methods of recharging JollyPay Wallet are subject to change at the discretion of JollyPay without prior intimation to the User. JollyPay may modify, terminate and/or suspend JollyPay Wallet to the User anytime with or without prior notice, due to any changes in internal policies, rules, regulations and laws set by JollyPay, relevant authorities or regulators. All refund of Bill Payment on the JollyPay Platform are final with the Entity or other JollyPay business partners. If a Bill amount has been charged to the User, or the transaction performed by the User have been completed, the User then demand a refund, it shall inform the Entity or other JollyPay business partners. The User will get refund if the User have gone through refund route from the date of approval of the Entity or JollyPay business partners. The User are responsible for any purchase of commodities or Services and all charge that result from refund. Please include in your refund application the Bill details including order number, the mobile number (or DTH account number or data card or toll-tag information), operator number/ name, recharge value, amount paid and transaction date etc. We may take longer to process your refund if we select it for a more detailed review. The way your money is refunded depends on how You made the original payment. If You paid with a credit card, the money is refunded to your card account. If You paid using a credit card, the amount paid by credit card is refunded to your credit card account. If you paid your JollyPay Wallet balance, the amount paid may be refunded to your JollyPay Wallet. If the card You paid with is closed or invalid, the money paid will be refunded to your JollyPay Wallet.